TULSA, OK (Feb. 21, 2019) -- Usually, a pre-race grudge match victory, followed by a solid qualifying run in the quickest Radials vs. the World (RvW) field ever assembled and a first-round win would add up to at least a satisfying outing for Keith Haney. However, the veteran drag racer left Lights Out 10 with mixed feelings over his results this past weekend at South Georgia Motorsports Park (SGMP). "You know what, if you take my weekend, it was absolutely, truthfully, a great weekend. We raced hard, had some fun and met some great race fans. I also want to thank my crew: Brandon Switzer, Andrew Arnold, Shane Goodnight, and Dale and Cale Hancock, and of course my girlfriend, Misty Hayes, for her undying support. I really couldn't be out there without any of them. "And Lights Out? I truly think it's one of the best shows on the planet, the Super Bowl of drag racing when it comes to little tires," said Haney, who also is a financial contributor to promoter Donald Long's annual events at SGMP. "The last time we raced this car was last April, when I won Radial Revenge in Tulsa. But we were in the finals last year at Lights Out, too, and I made it to the final four at Sweet 16, back when it was all more competitive. The way the rules are now, the nitrous cars are at a real disadvantage. And that's not just an opinion; that's a fact. And it's a real problem that has to be addressed or you're just going to have no nitrous guys showing up." To further his point, Haney said he will not be attending Long's Sweet 16 event, scheduled for Mar. 20-23, at SGMP. "First of all, I'm definitely supportive of this race, but I won't be at Sweet 16 because there's really no reason for me to take a knife to a gunfight. It just doesn't make sense from a business standpoint to spend the money even to make the trip to Georgia," he reasoned. Regardless, at Lights Out 10, Haney's first high point came within the second round of qualifying. 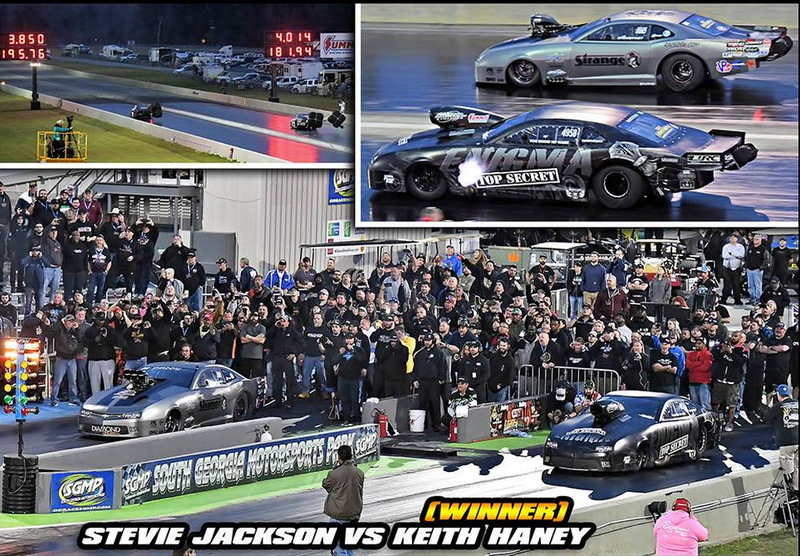 In a pre-arranged grudge match that paired the two most fan-favorite drivers, Haney and "Enigma," his nitrous-assisted 2016 Camaro took on Georgia's own "Stevie Fast" Jackson and his screw-blown 2018 Camaro in front of the biggest Thursday-night crowd in Duck X Productions history. Jackson got the jump off the start, but an eighth of a mile later, Haney crossed the finish line in 3.85 seconds at 195.76 mph to beat Jackson's 4.01 at 181.94 mph. "That was a lot of fun, I always enjoy beating Stevie. And people forget that's two in a row for me over him," Haney said later. "We had a little bet going last November at the Elite 16 race in Dallas (TX), and I beat him there, too." That pass placed Haney 21st in the provisional RvW field, but he later improved to 3.75 at 197.88 and officially started 17th, setting up a first-round eliminations race against Ken Quartuccio and his twin-turbocharged 2018 Corvette. Haney left first this time with a stellar .007 reaction time, then led stripe to stripe, posting a 3.81 at 196.07 over a hard-charging 3.85 at 207.66 mph by his Connecticut-based rival. "I'm actually a big fan of Ken Quartuccio," Haney said. "We've kind of got a mutual admiration society going on between us, so that was a pretty big win for me." Next up for Haney, though, was the daunting task of taking on class newcomer Kevin Rivenbark, who set a new RvW record of 3.61 seconds at 205.01 mph to qualify number one over a 32-car field that also featured a record 3.88 bump spot held by Jason Hoard. Haney left practically even with Rivenbark, but that was as close as he ever came to the ProCharger-equipped '69 Camaro, as it won going away with a 3.66 pass at 203.37 over a 3.77 at 195.11 combo from Haney in the left lane. The Tulsa-based new car dealer took the loss in stride, but felt it exemplified the rapidly widening gap between nitrous-injected entries and those employing some sort of air-pressure boost, whether via crank-driven or belt-driven superchargers or exhaust-scavenging turbochargers. "I knew I had to do my job on the line and I went .046 to his .044, so we left at basically the exact same time," Haney recalled. "But from there he just drove away. I mean, there was no chance against that car weighing what it does. I'm not going to say anything bad about the car or the guys that run it, they're doing an awesome job, but I am gonna' say that the rules fit them a heck of a lot better than they do us. The fact is, nitrous cars just can't get to the numbers these guys are running." The quickest pass by nitrous car at Lights Out 10 was the 2012 Camaro of Justin "Lil Country" Swanstrom, who posted 3.71 at 198.35 to qualify eighth. He and each of the other four nitrous entries that advanced from the opening round at Lights Out 10, including Haney, fell in round two. "Look, I'm a race promoter, too, so I also have to deal with these kinds of issues because at the end of the day if you don't have parity, you don't have anything. 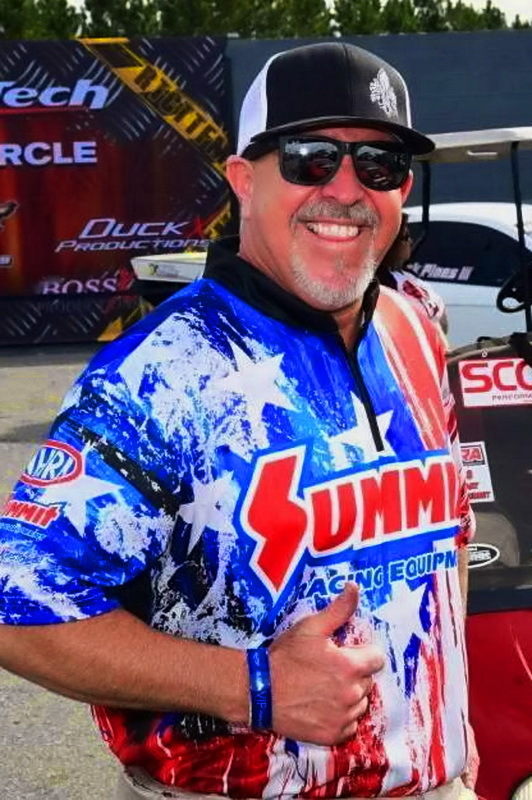 I just think we need some rule changes or eventually there's not ever going to be another nitrous car show up in Radials vs. the World and it'll end up being just a screw and turbo and ProCharger deal," Haney said. "Which is okay if that's what people want to see happen. That's up to those who are running the show. "I'll just keep doing what I've been doing with the Mid-West Pro Mod Series, NHRA Pro Mod, and I'm not saying I'm never coming back to radial racing. Far from it. I'm saying I'm not going to Sweet 16 this year. And I realize a lot of my fans will be disappointed, but I hope they understand I just can't under current conditions." Based in Tulsa, Oklahoma, Keith Haney Racing (www.keithhaneyracing.com) fields two cars in the Mid-West Pro Mod Series (MWPMS), as well as for select NHRA and PDRA races and one-off special events. Keith Haney Racing appreciates the support of sponsors Summit Racing Equipment, Lucas Oil, Strange Engineering, Kryptonite Kustomz, RacingJunk.com, MoTeC Systems USA, Switzer Dynamics, M&M Transmission, Menscer Motorsports, Total Seal, Mickey Thompson, Browell Bellhousing, Rickie Smith Racing, and Larry Jeffers Race Cars.